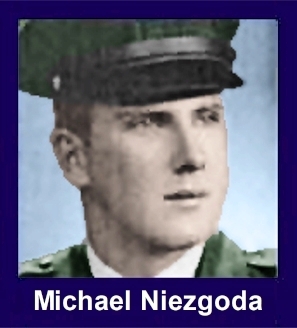 The 35th Infantry Regiment Association salutes our fallen brother, SP4 Michael Allen Niezgoda, who died in the service of his country on September 24th, 1968 in Quang Duc Province, Vietnam. The cause of death was listed as Small Arms/AW. At the time of his death Michael was 20 years of age. He was from Dearborn, Michigan. Michael is honored on the Vietnam Veterans Memorial at Panel 42W, Line 6. The decorations earned by SP4 Michael Allen Niezgoda include: the Combat Infantryman Badge, the Silver Star, the Purple Heart, the National Defense Service Medal, the Vietnam Service Medal, the Vietnam Campaign Medal and the Vietnam Cross of Gallantry with Palm Unit Citation. I was a young boy in religious class at Sacred Heart church, Dearborn. I won't forget Ms. Niezgoda, my teacher, suffering upon the death of her son. She wore all black this day and was crying, we didn't know what what was going on. We were young.